Dan Andriacco is well established as a formidable detective story writer and, no great surprise, as a formidable Sherlockian. It was only a matter of time before he turned his hand to a full-length and full-blooded exploit of the sage of Baker Street - and what a cracker it is! 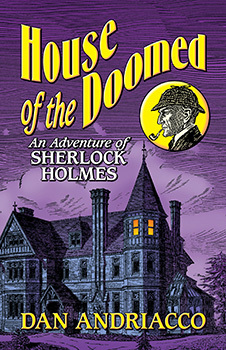 Shortly after the Queen's death brings an end to the Victorian era, Sherlock Holmes is invited to investigate an apparent vendetta against a young woman in Surrey. He and Dr. Watson have often visited the county, but the scene of the attacks is an area even more familiar to a certain Arthur Conan Doyle, who in 1897 had moved his family from London to a small town near Haslemere, in an area already popular among writers and artists. Rumours of ghosts and occult rituals add an extra frisson to the atmosphere of mystery and suspense as the screw gradually, remorselessly tightens. And as a nice bonus we meet an old friend, the one police detective who is undeniably on the same level as Holmes himself. Capital!